Mazār-i-Sharīf (Dari and Pashto: مزار شریف‎; [ˌmæˈzɒːr ˌi ʃæˈriːf]), also called Mazār-e Sharīf, or just Mazar, is the fourth-largest city of Afghanistan, with a 2015 UN–Habitat population estimate 427,600. 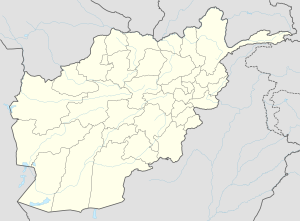 It is the capital of Balkh province and is linked by highways with Kunduz in the east, Kabul in the southeast, Herat in the west and Termez in Uzbekistan in the north. It is about 55 km (34 mi) from the Uzbek border. The city also serves as one of the many tourist attractions because of its famous shrines as well as the Islamic and Hellenistic archeological sites. The ancient city of Balkh is also nearby. From top left to right: Afghan Air Force helicopter flies over Mazar-i-Sharif; View towards the Blue Mosque during Nowruz; The Blue Mosque; Downtown. The name Mazar-i-Sharif means "Tomb of the Prince", a reference to the large, blue-tiled sanctuary and mosque in the center of the city known as the Shrine of Ali or the Blue Mosque. Some people believe that the tomb of Ali ibn Abi Talib, the cousin and son-in-law of the Islamic prophet Muhammad, is at this mosque in Mazar-i-Sharif, after Ali's remains were transferred to Mazar-i-Sharif as per request of Ja'far as-Sadiq. This is however rejected by other Muslims, as the majority believe he is buried in Najaf, Iraq. Mazar-i-Sharif is the regional hub of northern Afghanistan, located in close proximity to both Uzbekistan and Tajikistan. It is also home to an international airport. It has the highest percentage of built-up land (91%) of all the Afghan provincial capitals, and it has additional built-up area extending beyond the municipal boundary but forming a part of the larger urban area. It is also the lowest-lying major city in the country, about 357 metres (1,171 ft) above sea level. The city was spared of the devastation that occurred in the country's other large cities during the Soviet–Afghan War and subsequent civil war, and is today regarded one of the safest cities in the country. During the 1980s Soviet–Afghan War, Mazar-i-Sharif was a strategic base for the Soviet Army as they used its airport to launch air strikes on mujahideen rebels. Mazar-i-Sharif was also the main city that linked to Soviet territory in the north, especially the roads leading to the Uzbek Soviet Socialist Republic. As a garrison for the Soviet-backed Afghan Army, the city was under the command of General Abdul Rashid Dostum. Mujahideen militias Hezbe Wahdat and Jamiat-e Islami both attempted to contest the city but were repelled by the Army. However the Taliban retaliated in 1998 attacking the city and killing an estimated 8,000 noncombatants (see Battles of Mazar-i-Sharif (1997–98)). At 10 am on 8 August 1998, the Taliban entered the city and for the next two days drove their pickup trucks "up and down the narrow streets of Mazar-i-Sharif shooting to the left and right and killing everything that moved—shop owners, cart pullers, women and children shoppers and even goats and donkeys." More than 8000 noncombatants were reported killed in Mazar-i-Sharif and later in Bamiyan. In addition, the Taliban were criticized for forbidding anyone from burying the corpses for the first six days (contrary to the injunctions of Islam, which demands immediate burial) while the remains rotted in the summer heat and were eaten by dogs. The Taliban also reportedly sought out and massacred members of the Hazara, while in control of Mazar. The city slowly came under the control of the Karzai administration after 2002, which is led by President Hamid Karzai. The 209th Corps (Shaheen) of the Afghan National Army is based at Mazar-i-Sharif, which provides military assistance to northern Afghanistan. The Afghan Border Police headquarters for the Northern Zone is also located in the city. Despite the security put in place, there are reports of Taliban activities and assassinations of tribal elders. Officials in Mazar-i-Sharif reported that between 20 and 30 Afghan tribal elders have been assassinated in Balkh Province in the last several years. There is no conclusive evidence as to who is behind it but majority of the victims are said to have been associated with the Hezb-i Islami political party. Small-scale clashes between militias belonging to different commanders persisted throughout 2002, and were the focus of intensive UN peace-brokering and small arms disarmament programme. After some pressure, an office of the Afghan Independent Human Rights Commission opened an office in Mazar in April 2003. There were reports about northern Pashtun civilians being ethnically cleansed by the other groups, mainly by ethnic Tajiks, Hazaras and Uzbeks. NATO-led peacekeeping forces in and around the city provide assistance to the Afghan government. ISAF Regional Command North, led by Germany, is stationed at Camp Marmal which lies next to Mazar-i-Sharif Airport. Since 2006, Provincial Reconstruction Team Mazar-i-Sharif had unit commanders from Sweden on loan to ISAF. The unit is stationed at Camp Northern Lights which is located 10 kilometres (6.2 miles) west of Camp Marmal. Camp Nidaros, located within Camp Marmal, has soldiers from Latvia and Norway and is led by an ISAF-officer from Norway. By July 2011 violence grew to a record high in the insurgency. In late July 2011, NATO troops also handed control of Mazar-i-Sharif to local forces amid rising security fears just days after it was hit by a deadly bombing. Mazar-i-Sharif is the sixth of seven areas to transition to Afghan control, but critics say the timing is political and there is skepticism over Afghan abilities to combat the Taliban insurgency. On 10 November 2016, a suicide attacker rammed a truck bomb into the wall of the German consulate in Mazar-i-Sharif. At least four people were killed and more than one hundred others were injured. In November 2018, it was revealed to the outside world that 40 houses in Qazil Abad, an immediate suburb of Mazar-i-Sharif, used unexploded Soviet Grad surface-to-surface rockets as construction materials. As a result, several people were killed and wounded from a few explosions over the years. These rockets, left behind by the Soviet Army in 1989 at the end of the Soviet–Afghan War, were used as cheap building materials by the poor residents of the village. It was estimated that over 400 rockets were incorporated into the village as wall and ceiling beams, door-stoppers, and even a footbridges used by children. When the outside world discovered this fact, the Danish demining group of the Danish Refugee Council visited the village and, after asking the residents, began demining and repairing the buildings, removing safely disposing of the rockets through controlled detonation at the border with Uzbekistan. Mazar-i-Sharif has a cold steppe climate (Köppen climate classification BSk) with hot summers and cold winters. Precipitation is low and mostly falls between December and April. The climate in Mazar-i-Sharif is very hot during the summer with daily temperatures of over 40 °C (104 °F) from June to August. The winters are cold with temperatures falling below freezing; it may snow from November through March. Mazar-i-Sharif Airport – serves the population of Balkh Province and is also used by NATO-led forces, including the Afghan Air Force. It is being expanded to become the 4th international airport in Afghanistan. Mazar-i-Sharif is a multiethnic and multilingual society of around 375,000 people. There is no official government report on the exact ethnic make-over but a map appeared in the November 2003 issue of the National Geographic magazine showing Tajiks 50%, Hazaras 25%, Pashtun 10%, Turkmen 8%, and Uzbeks 7%. Occasional ethnic violence have been reported in the region in the last decades, mainly between Pashtuns and the other groups. Some latest news reports mentioned assassinations taking place in the area but with no evidence as to who is behind it. ^ a b c d e "The State of Afghan Cities Report 2015". Archived from the original on 31 October 2015. Retrieved 21 October 2015. ^ "On Tour in Afghanistan, Part 1: On the Highway from Kabul to Mazar-i-Sharif - Qantara.de". qantara.de. Retrieved 22 September 2018. ^ Boone, Jon (2 April 2011). "Afghanistan: when gentle Mazar-e-Sharif erupted in violence". the Guardian. Retrieved 22 September 2018. ^ host, just. "Welcome afghanmagazine.com - Justhost.com". www.afghanmagazine.com. Retrieved 22 September 2018. ^ Qala, Chris Stephen in Dashti (20 October 2001). "Fighters to repay Taliban cruelty". the Guardian. Retrieved 22 September 2018. ^ a b Rashid,Taliban (2000), p.73. ^ Goodson, Afghanistan's Endless War, (2001), p.79. ^ THE MASSACRE IN MAZAR-I SHARIF, THE FIRST DAY OF THE TAKEOVER. ^ a b Ehsas, Zabiullah (March 31, 2011). "Tribal elders in Balkh worry about assassinations". Afghanistan: Pajhwok Afghan News. Retrieved 2011-04-01. ^ "AFP: Koran burnt in Florida church". google.com. Retrieved 22 September 2018. ^ "German consulate in Afghanistan". Fox News. Associated Press. Retrieved November 11, 2016. ^ Fahim, Hamid. "Taliban attack German consulate in Afghanistan's Mazar-i-Sharif". yahoo.com. Agence France-Presse (AFP). Retrieved November 10, 2016. ^ "Afghan casualties in Taliban Mazar-e Sharif attack pass 100". BBC News. 22 April 2017. Retrieved 23 April 2017. ^ "First snow of this winter covered North Afghanistan". Mazar-i-Sharif. Ariana News. 9 November 2011. Archived from the original on 2014-01-25. Retrieved 25 January 2014. ^ "Mazar-i-Sharif Climate Normals 1959-1983". National Oceanic and Atmospheric Administration. Retrieved December 25, 2012. ^ "The State of Afghan Cities Report 2015". Retrieved 20 October 2015. ^ "2003 National Geographic Population Map" (PDF). Thomas Gouttierre, Center For Afghanistan Studies, University of Nebraska at Omaha; Matthew S. Baker, Stratfor. National Geographic Society. November 2003. Retrieved 2012-07-21. ^ Recknagel, Charles (March 14, 2002). "UN Condemns Attacks On Ethnic Pashtuns". hewad.com. Prague: Radio Free Europe/Radio Liberty. Retrieved 2011-04-01. ^ "Afghanistan: Situation in, or around, Aqcha (Jawzjan province) including predominant tribal/ethnic group and who is currently in control". Immigration and Refugee Board of Canada/UNHCR. February 1, 1999. Archived from the original on May 10, 2011. Retrieved 2011-04-01. ^ "Afghan railway: First train runs on new line in north". BBC News. December 21, 2011. 'The Massacre in Mazar-i Sharif'. Report of Human Rights Watch, November 1998, Vol. 10, No. 7 (C). Retrieved 18 November 2017. Wikimedia Commons has media related to Mazar-e-Sharif. "Mezar-i Sharif". Islamic Cultural Heritage Database. Istanbul: Organisation of Islamic Cooperation, Research Centre for Islamic History, Art and Culture. Archived from the original on June 15, 2013.